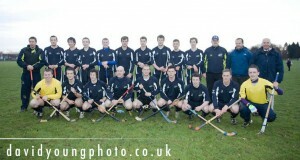 Last Saturday saw the Scottish Uni’s select beat the British Uni’s Irish Hurling select 20-2. The cold weather in Dundee meant the game was delayed by an hour due to the frozen pitch and had to be moved from the Riverside pitches to Dawson park on the other side of Dundee. The men’s squad was managed by GMA and Scotland Intl. manager George Hay and Intl. Senior player Kenny Ross, also goalkeeper for Lochcarron. The Highlands & Islands were well represented with Lewis being represented by Scott, and neighbours Skye represented by Kerr Gibb and ex-skye player Kieran Roberts who played against Lewis in last years North 3 for Aberdeen Uni. The 15 a-side game threw up at 2.30pm and due to dwindling light conditions was reduced from the usual 80mins of play to only 60mins, half an hour each way. The game got underway and was immediately obvious that this would be a scrappy, physical game thanks to the Irish hurling style. Scotland full back Peter Campbell gave the home side an advantage with his huge by-hits going way past the half way line into Irish territory. Ten minutes in, Strathclyde and Fort William player Sean Cameron opened the scoring edging a goal in for the home side. Both sides took a while to adjust to the game and Scotland increased their lead through Duncan Macrae and Duncan Davidson before the end of the first half. George Hay used the four rolling subs well through the short game and made sure the team was evenly rested. The second half saw the Scotland squad get a grip on the game with midfielders Garry & Iain Luke linking up well with the forwards giving the side a string of 3-point goals through Duncan Davidson, Duncan Macrae and Finlay Stark as well as multiple 1-point and 2-point goals from midfielders Munro, Gibb, Murray and Mcnab. Ireland managed to pull two points back but it was more than a long way back for them thanks to the solid defending from Peter Campbell, Tom Smith, Peter Grace & Kieran Roberts. 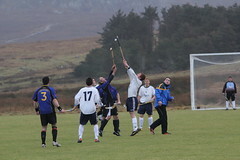 The physical aspect of the game went against the Scotland side but once the shinty players got into their stride of simple passing along the ground, the Irish found it difficult to get a hold of the game due to their mostly in-air play and the prohibited use of their hands to catch the ball. Final score, 20-2. Mille taing dha na Sgitheanaich airson tighinn a-nall! Lots of action at Shawbost on Saturday, it was a tough workout against a high quality side but should hold us in good stead for the rest of the year. Congratulations to Kevin and Ruairidh on their goals. One of the benefits of playing Skye is that they also have their own website and have already done a good report of the match, so here is a link to it. 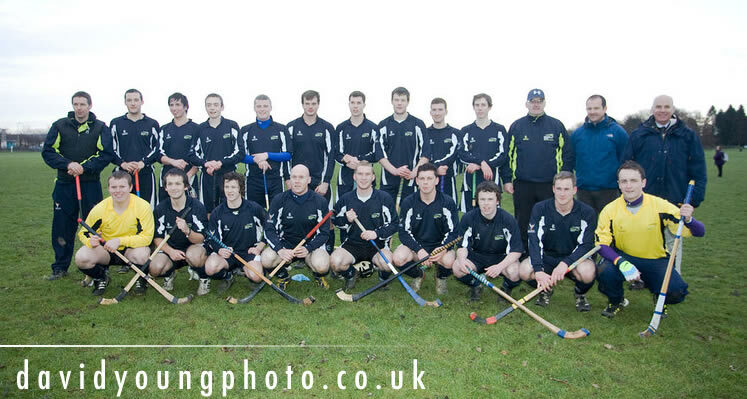 Camanachd Leodhais from:Euan Gilmour,Al Reed,Daniel Gallacher,Conor Macdonald,Paul Duke,Paddy Sinclair,Dougie Shaw,Michael Macleod,Donald Lamont(Capt. ),Daniel McFadden, Ruairidh Urpeth,Will Church. Subs Connor Chalmers, Kevin Kennedy, Calum Blane, Dudley Johnson, Ryan McCafferty, Stuart Campbell. Coinneach as usual took some excellent photos, see them here. Congratulations to Scott as well who scored a point as Scottish Universities had an easy win against British Universities GAA in Dundee, winning 20-2. Scott Murray – Honours Student. Congratulations to Scott on being selected for the Scottish Universities Squad for the Student International against British Universities GAA this Saturday 28th January in Dundee at the Riverside Grounds. 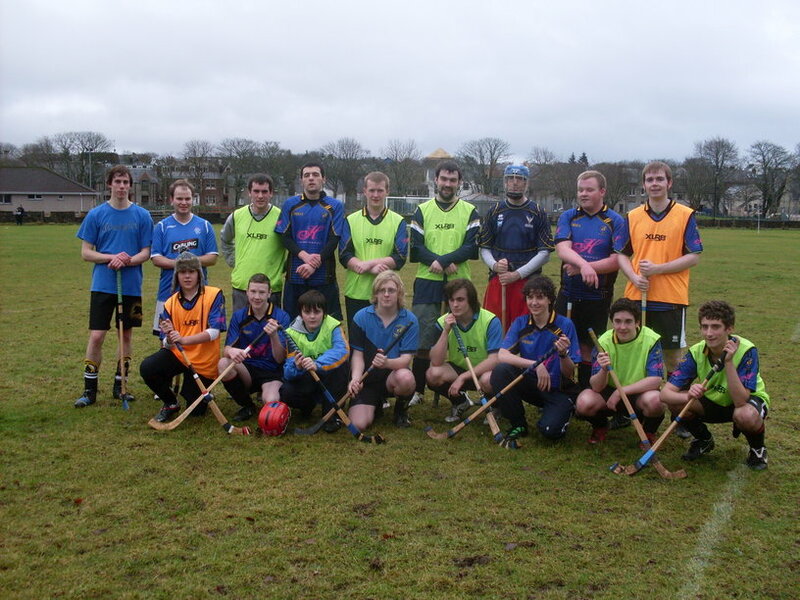 Scott is the first serving Camanachd Leòdhais player to be picked at this level, although Donald has been capped before whilst at Aberdeen and Sean played U-17 as well as all the boys involved in the Alba set-up. The full squads can be found here. Circuit Training 7pm-8pm @ ISL Sports Centre EVERY Thursday. All players must attend both sessions. Players should also do their own training as well. Those in Glasgow should attend Glasgow Green training EVERY Satrday @ 1pm as well as try and access one of the other trainings in the city. All players wishing to be selected this year should continue to attend training in Stornoway or Glasgow and also be working on their own fitness as well. 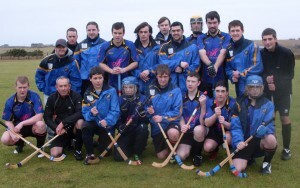 Saturday saw another great game of “Iomain Challainn”. Despite the weather, 17 players turned up with the juniors being especially well represented. Teams were picked between Daniel “Gaga” Gallagher and Scott Murray with Gaga’s side edging out in front after a close game and a few goalmouth scrambles – final score 4-3. Iain “Diablo” Sinclair managed to find a gold medal down the back of his sofa for the Man of the Match award which was presented to Ryan McCafferty after a fine performance, bagging two goals for Gaga’s side. 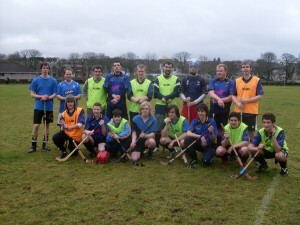 Thanks to all who turned up for the game to play/help out and lets hope the weather is better for 2013!